We are ordinary people with an extraordinary vision. Our Vision - to build a FIHANKRA village in Ghana - a place where street children live in families. We need you to partner with us to achieve this vision. We believe that accommodating street children in family homes with foster parents will give them a sure foundation until such time as they can be returned home or can live independently. During this time we will ensure they are educated, that their health needs are met, that they are taught a skill, if needs be, while at the same time we will be seeking to return the child to its family home. For any number of reasons the children are not living at home because their families need some support to ensure an adequate income and to maintain their children through education. We aim to ensure appropriate support is offered, tailored to the needs of the individual family. We will also establish a network to help parents track or trace their missing child to minimize the time a child is in a vulnerable or risky position. Our experience of Ghana is that many of its societal norms are laudable and should be celebrated. Because of this we will endeavour to ensure that the village is traditionally Ghanaian and equally as importantly that the street children are educated about the positives of living in this wonderful land. Our experience has been that many wish to grow up and get out and we seek to reverse that view. FIHANKRA’s name is taken from the Andrinka symbol meaning “safety and security”. 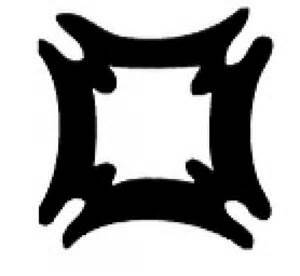 This Ashanti symbol denotes a compound with only one entrance and exit demonstrating a place of safety and security – and this is what the project aims to offer to orphans and vulnerable children. Our Values are integral to the work we do and the partners we work with. We are a Christian organisation and are motivated by God's love and grace . We believe everyone has God given potential...... and our desire is to see street - children enabled to maximise their potential. It is important to us that we help those in need regardless of faith and as such our beneficiaries may be of any faith or no faith at all. We value local cultural traditions and our desire is to uphold these traditions and norms in FIHANKRA village.